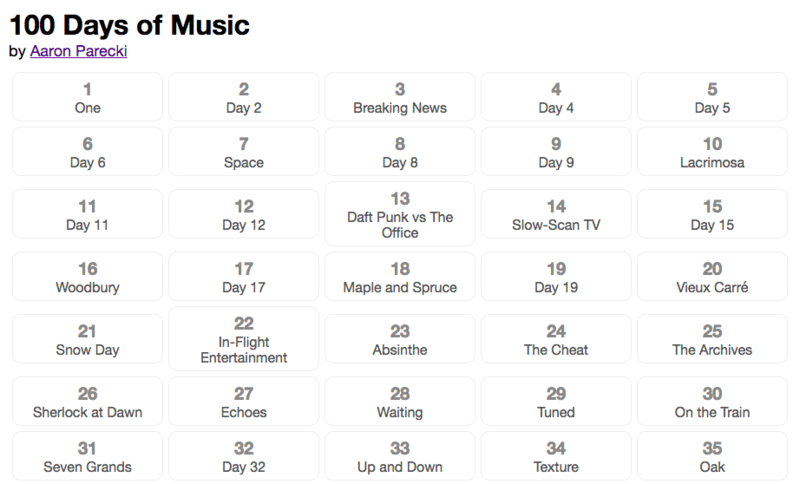 100 Days of Music is a project to write a short 30-90 second song every day for 100 days. My goal is to create something that's "finished" enough to be able to use it as a podcast or video intro song. It doesn't have to be long, but has to sound decent. The only way to get better is with practice, so forcing myself to limit myself to 1 day for each "song" means I won't be able to get stuck down a path of trying to make something sound "perfect", and will just focus on trying out new things all the time. You can see all the songs on a single page, subscribe to the podcast feed, view on iTunes, listen on SoundCloud, or if you have an Amazon Echo, add it to your Flash Briefing! Resubmitted my "Songs of the Morning" album with a few tracks combined, so the average length is longer than 60 seconds. We'll see if the music store overlords let this go through this time! I spent most of the day today naming the rest of my #100daysofmusic songs, tagging and organizing them, and uploading them for distribution through all the online music outlets! Look for the albums on iTunes, Spotify, Google Play, Amazon, and half a dozen other stores I've never heard of starting next week! I wanted a way to quickly browse and share songs from my 100 Days of Music, so I thought I would make a page with links to each song. Clicking on any of the tracks opens up a video player with the description of the song. I am curious to find out which songs people like the best, so to start with, I added some Google Analytics code to the page. I track events for each time a video is started, paused, when the video finishes playing completely, and if a video was interrupted by starting another. Hopefully this will provide some interesting data over time. I want to add a more robust feedback mechanism, possibly even a simple "heart" button people can click, but I'm not sure how I want to handle that yet so that will have to wait until later. I've made download links available for each track, in case you want to use these songs in your own projects! At the bottom of the page you'll see the copyright notice. I've decided to make these all available via a Creative Commons Attribution license, so feel free to use them for various projects! All I ask is that you let me know when you've used a song, preferably by writing a post about it and linking to the track on my website! That way it will show up as a comment on my post, like Marty's podcasts! Day 99. Almost done. I had fun with the pizzicato strings in this one. The pizzicato cello and the snare drum hold down the rhythm, and I have a few different violins and violas playing the melody. Day 98. Another multiple-layer piano track. Each piano has a different effect applied. Echo, reverbs, EQ to emphasize specific frequencies. Day 97. Further proving the theory that when I don't have a plan for the day, I end up finishing way sooner than I thought, today's song took less than an hour. As usual, I started this with the piano intro, and built it up from there. I considered using a drum set, but then opted for a light bongo track instead. The piano part is actually two overlaid tracks in the same range, which for some reason ends up working nicely together. I think the middle section could use a little more buildup, but the flute does an okay job at denoting the middle section. Day 96. I always seem to spend a lot more time on these when there's a specific sound I'm going for. This one turned out to take way more layers than I expected. I'm still a little confused why I couldn't quite get the string section to sound correctly "on" the beat. I tried snapping it exactly to the beat, and that sounded too lagging in some cases, so I tried moving up a few of the notes in some cases. It's not quite right, but it's about as close as I can get it. Day 95. I wanted to try something in a medieval style, so this is a quick sketch mostly experimenting with the instrumentation of it. Day 93. I didn't end up finishing today's song before going to the studio for my last class, so I had to finish it here. I ended up doing something pretty simple just cause I didn't have much time. The video is some test footage we shot on the green screen earlier today. Day 92. This is maybe a little more wander-y than I wanted, I wasn't expecting to bring in the orchestra in the middle until after I had started. I originally thought it would be just piano again. There's a couple little nods to some other songs in here if you listen closely. Day 91. I don't know why I'm on such a piano kick lately. This one was kind of fun because it's more notes than can be played with two hands, but doesn't totally sound like it. Day 90. The final stretch! Didn't know what I was going to do today, so again I started by playing around on the piano until I hit something that I could use to build off of. After I recorded the piano track, I added a few other instruments on top. The drum track is a mix of my own tracks plus the Logic Pro drummer. Day 89. This is all one take on the piano, with only a little tweaking of the timing and loudness of some notes. I was planning on adding some other instruments to it, but nothing seemed to fit quite right. I ended up adding an echo to the piano with an 1/8 note delay. I only added the echo to the notes on the beat, not on the little runs, because that muddied it up too much. Day 88. Another fun five-part piano piece. Each piano is panned slightly off-center. Some of them are a 2 bar loop, others do slight variations of their theme for each phrase. I decided to let this one fade out rather than do a build-out, since it would have ended up too long otherwise. Day 87. Today was the first day in a while that I started a song by playing the piano for an hour before writing anything down. Once I knew what I was going for, I recorded the piano track. I added the other two instruments, a Duduk and Electric Cello, mostly following existing aspects of the piano melody.